A happy new to my readers who now populate 124 countries of the world. Music education would seem to have a global speak. In 2018 I have had something of an obsession with the question of knowledge and its complexities in the case of music. There are some twenty blogs on the topic. There will a good amount of repetition no doubt. However, attention to the nature of musical knowledge has never been more critical in view of the official way in which knowledge is being conceptualised as part of curriculum reform in England. The Greeks had some twelve words for knowledge. The Germans and French have at least two and in all three cases the distinction is made between a scientific form of knowing, knowing that something is the case, and other forms of knowing. The Greek words techne (art, craft, skill) and phronesis (prudence) offer ways of knowing that have ethical significance, for example. The dominant discourse in England speaks of bodies of knowledge and it is ‘knowing that’ into which all other murmurings of ways of knowing are collapsed. 2019 in England will be the year when our schools will be re-setting their curriculum statements. You see there are the three Is – Intent; Implementation; Impact. These are the markers set down by Ofsted, the school’s inspection body in England. Sean Harford HMI, National Director for Education at OFSTED clarifies what is to be understood by the three Is. Knowledge and understanding. No mention of skills. And what kind of knowledge will Ofsted have in mind? And what of musical understanding? Musical understanding is defined by cognitive psychologist John Sloboda as akin to getting a joke – music understood without the mediation of language. I am the music while the music lasts. Perhaps behind the scenes is an ideological conflation of a narrow conception of culture with a narrow conception of knowledge. Ofsted operate without fear or favour creating fear and trembling. Source not known but taken from a consultant’s powerpoint slide. Thomas Hardy’s Under the Greenwood Tree, like much of his writing, contains references to music-making. Hardy’s interest in the social conditions of his characters is matched by interest in the social conditions of their music-making. For Hardy music is social practice. Musical meanings and musical knowledge are made here and now together and bound to the meanings made through the relationships of those participating. And all this in relationship to their place in the social order. In the case of Under the Greenwood Tree there is the story of the Melstock choir, a band of local musicians playing and singing in the west gallery of their village church. Their music is silenced by the installation of the organ and a well-tutored organist. The imagined mediocrity of the locals is replaced by the imagined more refined and civilising sounds of the organ and the organist’s playing. Ah! ‘the best of the musical canon’, where have I heard that? Here are two utterly different conceptions of what music is, what it is for, how it is educative; what culture is and what it is for. While there is the knowledge of the powerful  exemplified in the edicts of our cultural administrators, it may be the carollers at the Sportsman Inn who will be in touch with incomparably more knowledge of music as a human practice and perhaps, just perhaps, of humanity too. Under the Greenwood Tree by Thomas Hardy, London, MacMillan, 1964 page 24. Gove, M. (2011) The need to reform the education system. Speech made at the University of Cambridge, November 24. ‘Pubs preserve the carols dusted away by the Victorians. Guardian, Monday 15 December 2014 page 5. See http://www.localcarols.org.uk/sings.php for this year’s programme of singing. Michael Young contrasts ‘The knowledge of the powerful’ with ‘powerful knowledge’. See http://www.fpce.up.pt/ciie/revistaesc/ESC32/ESC32_Arquivo.pdf I have simply appropriated the phrase ‘powerful knowledge’ here and don’t necessarily imply anything of Young’s thesis, interesting though that is. I do concede that I am in some part a romantic. Philosopher Michel Foucault notes that nostalgia can be a rich source of critique should readers think I am indulging. A couple of weeks ago some three hundred music educators gathered for the annual Musicmark conference. My perspective as a former secondary school music teacher comes from within the school, the traditions of music as a school subject, its debates and vigorous contestations over the last century and a half and the enduring commitment to musically educate all children and young people as part of a general education. Yes, a general education, not a specialist one. In this view a music education is not something apart. It is called upon to have allegiances with the aims of education as a whole, that is, a general education for all children and young people sponsored by the state and which is compulsory. In this view it has a responsibility to the whole educational endeavour to which all children and young people are entitled. Otherwise, why include music in the curriculum? Have you heard these kinds of sentiments? Ensure musical health and wellbeing for all. These are the kinds of beliefs that come to be expressed as the purposes of music education. They frequently become translated into advocacy statements and at that point too easily becoming promises that can’t be kept. But while all being admirable and desirable, are the sentiments above sufficient if music is to be a subject of the school curriculum, a dynamic part of the whole that is a general education? What if we started from a general educational aim. John Beck offers one such worthy aim. It wouldn’t require much tweeking to create a worthy music educational aim. But we might note that here the individual child is held in relationship to society. Education is more than for the benefit of the child. Beck goes on to point out that such an aim is grounded in a concern for children as future citizens in a democratic society. So straight away there seems to be rather more depth to the project that is educate than heard in music education advocacy statements. Well, this is stronger stuff and might well inform the kinds of aims we set forth in respect to a music education as part of a general education? I am not sure. What do yo think? Well, at least we have travelled beyond the popularist sentiments relating to ‘placing the child at the centre of music education’ and its tendency towards rhetorical advocacy; and perhaps opened up some space in which the aims of a music education for all children and young people as part of a general education (represented by the school) might be debated and determined, and distinguished from, compared with and perhaps harmonised with the purposes of music education from beyond the school. Oh, and did anybody else think that much of what was being described as research at the conference was oddly research that was built upon the sand of not knowing what was already known? Is this really a good basis for innovation and change? And to end three questions for debate. 1.What does it mean to be musically educated as part of a general education for all children and young people to age 16? Beck, J. (2013) Powerful knowledge, esoteric knowledge, curriculum knowledge. Cambridge Journal of Education Vol.43, No. 2, page 187. @WRoberts3 Crickey. Have others seen this? Amazing example of why REAL (not this) music instruction is so profoundly valuable in a rounded education. Telling that they had to go all the way to America to find a musician who thinks cognitive load theory is a good foundation for a lesson. It was this, an example of Cognitive Load Theory in practice, that came via twitter as part of the ‘every teacher should know’ movement. Cognitive Load Theory (CLT) is an example of the current interest in, and promotion of theories thought to improve classroom practice and children’s learning. ‘CLT’, ‘interleaving’, ‘dual coding’, ‘retrieval practice’, ‘Direct Instruction’; these are amongst the ideas abroad at this time. The example above is just one attempt to contextualise such ideas in the case of a particular subject. And it is at this point that problems can arise. Before examining the example above, it is helpful to point out that this new science of learning, of which CLT is an exemplar, places great emphasis on the role of memory in learning, and in particular, the building of long-term memory. In this CLT claims high status; it seeks to explain the relationship between working memory and long term memory. And within this discourse there are some who see the goal of education as a matter of expanding long term memory or if you prefer, knowing lots of stuff. Usha doesn’t venture further with her examples. But what about ‘musical working memory’, the capacity to hold a musical idea in mind, in the ‘mind’s ear’. Oh, now we can expose the paucity of the example above, and as Gary Spruce pointed out, its utter ontological failure in respect to music. But wait, some more explanation. The central issue is the need to avoid cognitive overload. The reader may be already ‘glazing over’ at this point. If this is the case you are experiencing cognitive overload and I should have further broken down the information that I am presenting into more discrete elements. This would enable the building of a comprehensive picture of CLT and the issues arising. If there is cognitive overload then learning will be impaired if not negated, and long-term memory left deprived of new knowledge. What is of note here is that what is referred to as the auditory channel is Usha’s ‘verbal working memory’. But what about the auditory channel being the music itself. There is no mind’s ear in play. Is it worth making a fuss about this? Well, yes. Because it is an example of the dispensation of theory through limited understanding of the nature of music. The purveyors of the evidence informed/research informed movement, almost invariably fail to grasp the essential non-verbal nature of music, being ignorant of centuries of music educational pedagogical wisdom and the subtle role of verbal mediation in music instruction. Within some of our schools CLT is likely to be flavour of the month. For the last decade at least, music teachers have been struggling to cope with the misrecognition of what is the nature of musical knowledge and experience seeing them coerced into demonstrating learning in unmusical ways. So how did all those songs get into your head? Can it be explained by CLT? 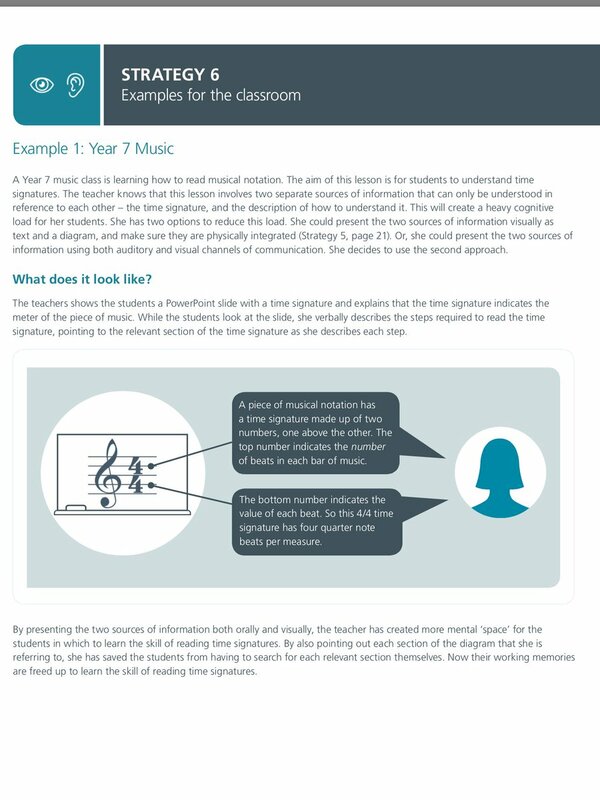 Do music teachers really need to know about CLT? Goswami, U. (2014) Child Psychology: A Short Introduction. Oxford University Press. Reif, F. (2010) Applying Cognitive Science to Education. Thinking and Learning in Scientific and Other Complex Domains. Cambridge, MA: The MIT Press. I wonder if this inspired the example provided. And what does page 25 have to say? In so far as I am claiming to be wise I must add that I am growing old and at least in that respect feel that I may be entitled to do so. The music in the gym this morning was very loud. Radio 1 easily overpowered my iPod choice this morning, the Lesser Litany of Thomas Tallis. Oh, the uses to which music is put. I politely asked the receptionist whether users of the gym liked the music to be so loud and was Radio 1 the preferred option. This unsurprisingly was not known. But they would look into it. Well, I have started a conversation at least. I wonder how it will conclude. OK, I just need to get some better earphones. I sometimes propose that the purpose of music making in school is to enable music to be made well. And you say, what on earth does that mean? Well, the ‘well’ bit can be elaborated through phronesis. We should note that it is a practical form of knowledge melting into oblivion any skills-knowledge dualism. Of course, phronesis won’t fit into a knowledge organiser. The years 1965 to the coming of the National Curriculum in 1992 were a time of energetic debate on the nature of knowledge and the curriculum. And this was my starting point in part 1. The debate yielded a rich body of literature now little known and no part of today’s stuttering and starting conversation around the subject where the race to knowledge organisers, curriculum templates and the reprofessionalising of teachers as the new curriculum-knowledge bearers gathers pace. The value of musical knowledge, in its many shapes and forms, is contingent. Yes, values, so distinctly absent from much of the current discourse about knowledge and the curriculum. As Martin goes on to argue, much of the current discourse around knowledge speaks of a paucity of attention to the ‘value for what’ question. But let the arbitrator be an example that might deemed to be, in some sense, knowledge rich. The account was written in November 2017. As last Sunday approached I turned my thoughts to what music I should play before and after the morning service in the village church where I was to play. It was Armistice Sunday and there would be times of thoughtful remembrance in the service. I felt sure that before the service I should play something solemn and fixed on Handel’s Largo as it used to be known. However, I remained far from certain about what music I should play at the end of the service. Should it be bold, loud, triumphant, glorious? I wasn’t sure. By Sunday morning I still had no clear idea about what would be right. I did have the book in which Handel’s Largo featured amongst ‘100 of the world’s favourite pieces’ and my thoughts rested on several possibilities. In the event, and as the service proceeded, I began to sense what would be right. There were the silences and I thought of my own fore bearers killed in both wars. There were poignant words read by a frail age-ed man and the final hymn was to be ‘I vow to thee, my country’. I now became clearer about what would be right. I would play ‘I vow to thee, my country’. The congregation would make good sense of this repetition I thought. As the time approached to play my final part in the service I again felt the mood of the place as I imagined the people’s feelings and sensibilities. And now with a sense of what was right here and now I drew the Lieblich Gedact stop  and played the first line of ‘I vow to thee, my country’ slowly and as a single line melody, the second line harmonised and so on with some variation and ending with a lone voice in the lowest of registers. Later I reflected on what kind of knowledge I had been engaged in. It wasn’t a matter of knowing that this is the case, these are the facts, here is theoretical knowledge  to be applied, but a practical form of knowing bound to particular circumstances drawing upon feeling and intuition to discern what was right. Thought was bound to feeling. It was knowledge that was experienced, felt, saturated with value and independent of concepts and categories and not translatable to any other kind of knowledge. All this has great relevance for the music classroom and just what it is that is being valued (assessed) and for the ways of knowing that are being prized, for the ways pupils are making sense of their experience. In response to the demand for a knowledge curriculum, for facts to lead the way, for knowledge to be reduced to statements of truth, for 100 pieces of classical music to be recognised and named, it is helpful to be reminded of a practical form of knowledge that I have tried to communicate above. This will be about learning and living out dispositions towards making music well, finding out what feels right so that all other manifestations of musical knowledge can be imbued with meaning, significance and placed with care in the order of things. ‘Ombra mai fu’ from the opera Serse. Just to note that Michael Young’s Powerful Knowledge is theoretical knowledge.